The Ashes Test seems to have provided very low innings scores - indeed they are more the kind one would have expected to see in an ODI, and even then they would have been considered on the low side. It seems to me there are a number of possible explanations, and you'll have no doubt what I suspect what one of the possibles is. Firstly of course it could be the Bankstown wicket. I have written before on the strange choice of venue so there's no need to go there again, and it's quite possible the curator as they say down under has done a fine job. Or it could be that players are simply not used to the idea these days that time is a completely different constraint in four-day cricket rather than in any 'overs' version of the game. And then again maybe (and this would apply to both teams of course) that we are at the end of a long series. And what is more that series was dominated by T20s. Are we already seeing the effect of this form of the game becoming dominant at international level? 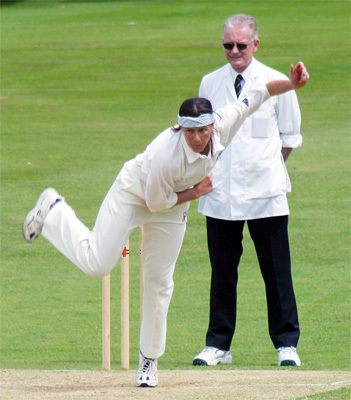 Women Cricket World, It is the first site fully dedicated to world of women' cricket. It looks a neatly put together site, if a little slow to load, and I am wondering how often it might be updated. I always welcome a new site - the sport can't have too much exposure it seems to me - but apparently the site owners haven't yet discovered Google. As you'll see from the opening page I have been running this site since 1997 and I wasn't (quite) the first - actually the second as far as I could discover. And "fully dedicated" must mean something else outside these islands (UK) as there is a tab for the men's forthcoming World Cup. Nonetheless I wish them well. Let's have more! Postscript - sadly it appears (2013) that the site is defunct. One of the game's greatest players in recent times has just announced her retirement from all cricket. Many (I hope) will write more thorough appraisals of her career than me. She was playing when I started watching this sport in 1993 and won a World Cup winners' medal that year. And that was five years after her international career had started. As I watched her play for England and at the Counties over the following years she stood out from the crowd for reasons that might not seem remarkable in women's cricket today but 'Romper' was ahead of her time. She was obviously an extremely fit individual in a period when that could not be said about many in the England side. One of my more vivid memories is of a gallant head first slide around the boundary boards at Taunton in the days before anyone thought there should be a few feet from rope to advertising. I can think of no other player in the England squad at that time who would have even attempted the stop and I winced and waited for her to rise. Needless to say, Clare gave no sign of any damage and, tellingly, for those like me who value the old values in sport, showed no vexation that the attempt had failed. 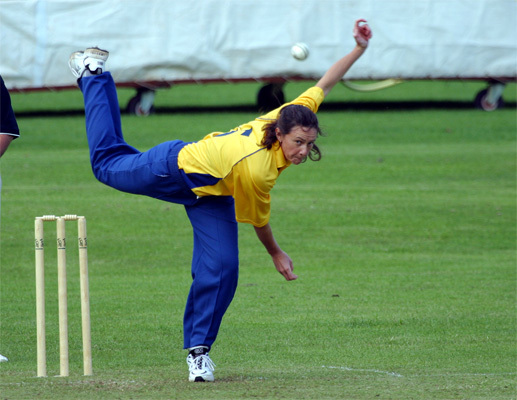 As a bowler her talent was so often in keeping the opposition quiet. When England were leaking runs I have often asked, or been asked, "How many overs has Romper got left? ", the implication in the question being all too clear. On one occasion walking towards one of the county games, and still some distance away I asked the England selector I was with "Who's that bowling?". He said "Watch the kick!" It could only be Romper. She was also useful as a batsman. One particular talent, well exhibited in the semi-final of the World Cup in 2005 (picture below), was in making singles when no one else seemed able to. I recall clearly a match in the Super 4s some years ago when she was batting with Beth Wild, also a swift runner. The second match in the tournament was being played on an adjacent field. Had I been England coach I think I would have stopped the second game and said to the players there "Just come and watch this and learn!" Both players were not just swift of foot but superb judges of whether there was a single there in the first place. To me it is the mark of a great player that the first time the team appears without her you find yourself looking around the field wondering where she is until the realisation strikes you. The feeling that all is not as it should be remains with you. It has happened to me less times than the fingers of one hand, but Romper's departure from the England scene was one. Off the field she is an amusing and witty conversationalist, with the gift of keeping a smile permanently on your face as you chat. It was great to catch up with her watching the World Cup in 2009 in Sydney. I used the picture below in 2003 on a flyer advertising a charity match played between the England side of 1993 and the side ten years on. When someone asked Clare why she had such a pained look on her face ... well put it this way ... I best not type the reply but it makes me smile to this day. I must also say a personal "thank you" to Romper for the gift of an England Test cap. As she gave it to me she suddenly realised the word "ROMPER" was written inside it in capital letters. She knew full well I had noticed she had just spotted it, but with typical wit she remarked "I've autographed it for you!" 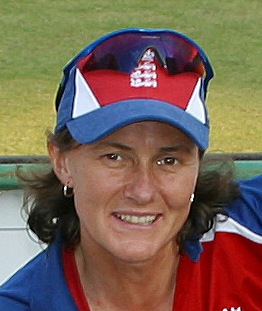 As a player who might well have carved out a successful football career (she played in World Cups in both sports) cricket was fortunate indeed to have had her services as a player. I do hope the sport continues to reap the benefits of her experience in some other capacity.